I see these “Empties” blog posts and videos all the time in the beauty blog world and I thought I’d give it a shot too. :] I don’t know how often I will post these though. I don’t feel like I go through enough things to do them monthly, so maybe I’ll do them quarterly? Or maybe I’ll just do them when I have at least 4-5 products to talk about. Who knows? 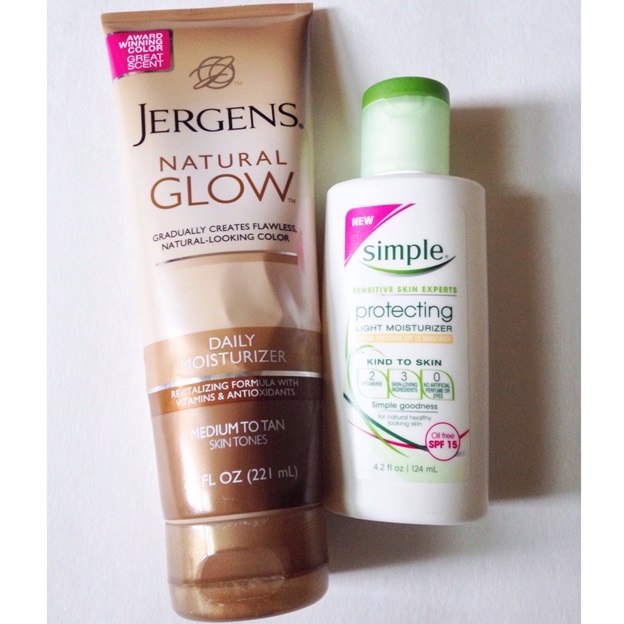 Jergens Natural Glow* – I love this lotion. I’ve used it for 2-3 years now. I’m not one to get in a tanning bed (They’re SO bad for you!) and I also don’t get out to the beach/pool as often during the warmer months anymore. This lotion does a great job of giving you a hint of color without smelling like a sunless tanner, leaving streaks, or leaving any orange-ness in any way. I use it once daily after my shower at night. This bottle was actually from last year. I took it out over the weekend since it’s starting to warm up and I wanted to get a jump start on not being so pale. There was about half a squirt left in it… Why did I decide to keep half a squirt from last year? LOL! I bought a new bottle this past weekend though, so I’m good to go. Simple Protecting Light Moisturizer* – This is actually my second bottle of this and I LOVE it. Over the Winter the skin on my face got super dry. 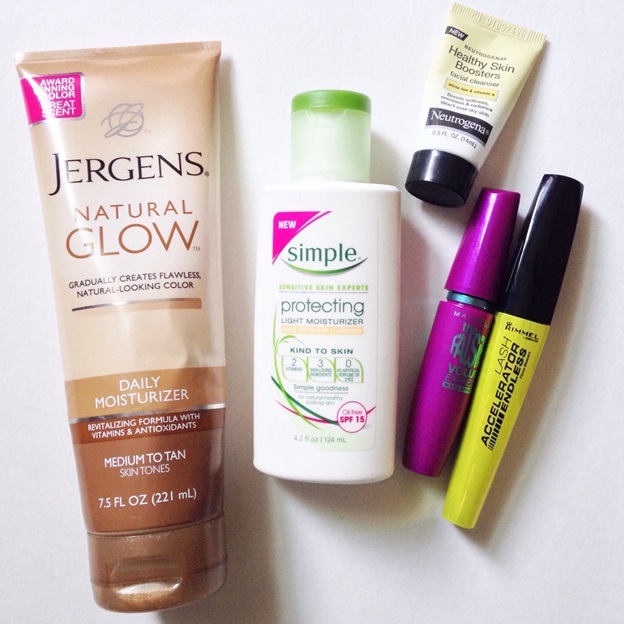 I have sensitive skin and I’m always worried about trying new products. (No one likes a break out!) While I was searching for something more moisturizing, I came upon this product and saw that it was “all natural” and decided to give it a shot. (I also love that it has a little bit of SPF in it.) My face isn’t as dry in the warmer months, so I ran out of this product just in time. I probably won’t buy it again right away, but I’ll definitely keep it in mind for next Winter when the air is dryer. Neutrogena Healthy Skin Boosters* – If you remember, I got this sample product in my first Walmart beauty box. I’m normally not a huge fan of trying new skin care items (sensitive skin) so I normally stick to my tried and true products – especially with cleansers. However, I’m a huge fan of Neutrogena so I did give this a try. Um, LOVE. I currently use the Neutrogena Naturals Fresh Cleansing + Make Up Remover*, but once that runs out I’ll go out and buy a full sized bottle of this Healthy Boosters product. It made my face feel SO soft and I’d love to test the claim about it “boosting evenness and radiance”. Maybelline Falsies in Waterproof* and Rimmel Last Accelerator Endless* – I remember trying this Falsies mascara a while back and really liking it, so I decided to try the waterproof version. I don’t know if I just didn’t remember correctly or if the formulas are totally different, but I wasn’t a huge fan of this version. It’s a really wet formula and it just didn’t do much for my lashes. Have you tried these products? What are your thoughts? 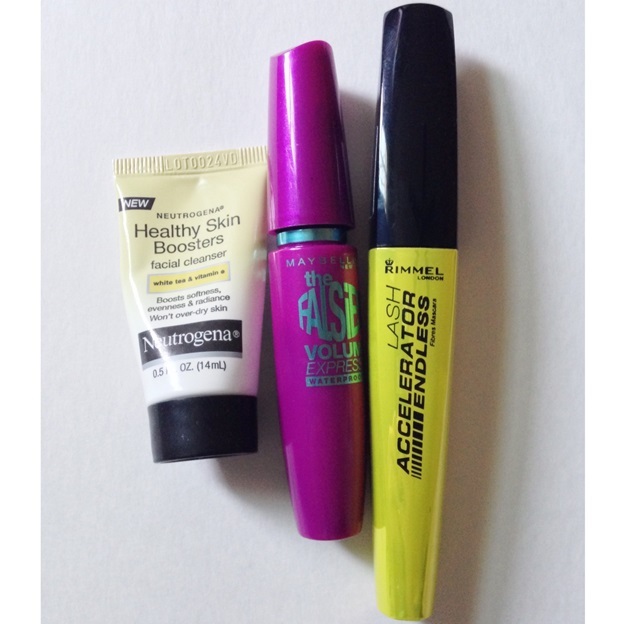 What’s your FAVORITE mascara? I’m obviously catching up on your blog haha. I was thinking about doing an empties post too I just need to stop throwing everything away! Does that Jergens Natural Glow have any scent? I hate how they smell but my pale legs need some help.